New Zealand’s equestrian eventing Olympians are visiting Canterbury next week, giving local riders and enthusiasts the chance to get up close and personal with the bronze medal winning team. Aside from the official New Zealand Team Welcome which kicks off at noon at Pioneer Stadium in Spreydon on August 24, budding equestrians, eventing faithful and interested public will get a unique chance to see Andrew Nicholson and Jonathan (Jock) Paget, currently ranked the number one and three eventing riders in the world, in action at the National Equestrian Centre at McLeans Island from 9am. Nicholson and Paget will be taking three short lessons with National squad members Emily Cammock, and Annabel Wigley, and leading local young rider Katie Rankin. Following the official welcome, Paget and Nicholson will return to McLeans Island with fellow Olympians Mark Todd, Jonelle Richards and Caroline Powell at 2.30pm for a panel discussion, question time and open afternoon tea where supporters will get a chance to mix and mingle to recognise and help celebrate their outstanding achievements at the London 2012 Olympic Games. Eventing Canterbury chairperson Viv Butcher said it was an honour for Eventing Canterbury to host theeventing Olympians at McLeans Island. She said Friday morning’s lessons would give people a chance to watch leading aspiring riders have lessons from of the best of the field in eventing. “Sharing the experiences of our medal winners at Olympic level of competition is unique. It is opportunities such as these which motivate younger riders within our sport to aspire to represent New Zealand. “I am sure this wonderful experience will be long remembered by those who are fortunate enough to attend,” Butcher said. Time allowing, there may also be a cross-country walk, with the Olympians giving tips on riding the fences. All those interested are invite to head out to McLeans Island. 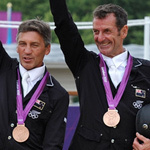 2.30 – 4.30pm: McLeans Island – Panel discussion, question time and afternoon tea with the bronze medal winning NZ eventing team.